UPDATE: Nearby Notifications will no longer be supported on Android smartphones after December 6 2018. Please read this blog post to understand how you can continue running proximity marketing campaigns through beacons. Google Nearby notifies you of things that can be helpful near you by surfacing location-specific notifications for apps and websites, with no prior app installed. Nearby has been growing in popularity for the last few months. In this blog, we will discuss answers to questions we frequently receive from our customers about Google Nearby. Let’s get started. 1. What is Google Nearby? How does it work? Google Nearby allows users to discover nearby devices or contextual information without an app. There are three types of these interactions: nearby messages, communication, and notifications. Nearby Message service helps discover and exchange information with other devices, without having to be on the same local network. Communications is about bringing nearby users together digitally. This could be for data transfers, multi-screen gaming, or other kinds of sharing. Google Nearby Notifications send location-specific notifications to users, no app install required. These come in the form of secure URLs. How does Google Nearby work? Google Play service continuously scans for beacon devices in the background. Once it detects a beacon in the range, it sends queries to the Google Nearby database to check if the beacons have any attachments. If a beacon has any Google Nearby notification attached to it, it displays it to on the mobile device. How does Google Nearby scanning work? Google Nearby scans for notifications when you press the lock screen button (display wake up) or when the phone is unlocked. 2. What all can you do using Google Nearby? As the beacon space matures, the use-cases also increase exponentially. Most of these use-cases make use of Eddystone protocol to reach out to customers without the need of an app. Google Nearby scans for Eddystone URLs display on the smartphone. Google recommends a list of things that you can do with Nearby. Launch conversations or chat bots inside messaging apps. Drive check-ins, reviews within local/travel apps. 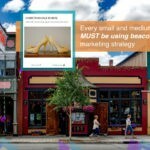 These capabilities are continue to make beacon campaigns highly interactive and engaging. 3. How to use/set-up Google Nearby? You can simply use Beaconstac or a similar service. Once you receive your beacon hardware order, you can instantly start engaging with customers using Google Nearby notifications. This option is great not only because it is simple but also because you can set-up proximity marketing campaigns all by yourself – no need for a developer or an app provider. Plus, you get all the proximity data you require to iterate on your campaigns. The second way to leverage Google Nearby is a little more complex and time-consuming. To integrate the Google Nearby API into your app, you need to have the bandwidth to build an app or a complete platform from the scratch. This platform should include a content management system, analytics and also other basic features for a marketing campaign. 4. How do Google Nearby notifications impact businesses? Google Nearby has been a dominant push to SMBs that are held back from investing in beacons due to the need for an app. 5. How can the end user turn on and turn off Google Nearby notifications? 1. Go to Google settings, and under the services section they will see ‘Nearby’ and ‘Nearby discoveries’. 2. Make sure that Nearby is turned “on”. Once the Nearby is turned on, they will start scanning for devices around them. Once the mobile device is in the range of a beacon, it displays the scan results. 6. What’s the customer experience of Google Nearby notification campaigns? Your users get a notification on their mobile device. By clicking on the notification, they are directed to a markdown card, or a linked custom URL or a form. We have created an Android mobile prototype for you to visualise the experience. 7. Google Nearby vs Physical Web: Which is superior and why? Apps that use the Google Nearby API send telemetry information to the Google beacon platform where you can monitor the health of your beacons. This report contains the battery level, count of frames that the beacon has transmitted, length of time the beacon has been active, beacon temperature and much more. Read more about why Nearby is superior to Physical Web. 8. Can I combine the experience of an app with the power of Google Nearby? 1. Are the edits to the Google Nearby campaign updated real-time? Absolutely! With Google’s new updates to Nearby, the campaign notification updates in real-time. It does not update itself if someone is already viewing the markdown card. However, it updates for someone who has just walked into the beacon range. 2. Where and when does the scanning happen, if not in my app? Scanning is done in Google Play services build into the Android OS. You can have your own app to do that as well but not very useful. 3. Does Google Nearby work only on Android devices? Yes, for now, it only works on Android. Google Nearby service is supported on all Android 4.4 (KitKat) and newer. However, Google Nearby does support iBeacons. 4. Can I schedule my Google Nearby notifications for a custom time? Yes. With Beaconstac, you can schedule your proximity campaigns for a specific day of the week and at a particular time. A coffee shop owner might want to send two different campaigns for weekdays and weekends. Here’s how you can Schedule a campaign. Bengaluru Metropolitan Transport Corporation(BMTC) is working towards digitizing the entire ticketing experience using beacons. A pilot project was introduced on May 31st 2018. Beacons are deployed on buses and bus shelters. These beacons will automatically send URL notifications to smartphones with Google Nearby. Google released v2.0 of the “Nearby Connections” API last year. As a part of this version, Google allowed gadgets like digital signage to communicate with smart devices in the proximity. According to some the commits on XDA Developers, Google might be coming up with Nearby API integrations with Chromebooks. If this goes live Android phones and Chromebooks will be able to receive relevant beacon Nearby notifications. Stay tuned for more updates on this. Did you know there’s an awesome free Nearby Notification platform a with deals, coupons and business cards on nowsquare.com.